What if the next generation of great stories isn’t even offered in print? One of the things I love about the ManageWP community is that it’s made up of a fun and interesting mixture of pragmatic doers and imaginative dreamers. When it comes to being an entrepreneur – which I’ve come to realize many of you are (as am I) – that’s a good mix. It means that when it’s time to get things done you can switch into “closed mode” and knock out a to-do list. It also means that when there’s a problem to be solved you can switch into “open mode” or “creative mode” and dream up new solutions for whatever problem you happen to be facing. It makes you exciting, dangerous and a good group to brainstorm with as you can actually follow through afterwards. As such, I’d like to try an exercise with all of you in open mode thinking. So buckle up because this post is going to be all about exploring the unknown potential of WordPress as a unique storytelling platform. Over the years WordPress has been a lot of things. It began as a simple blogging platform, progressed into a content management system and is becoming an app environment and possibly even a web operating system! This kind of big and rapid advancement is an integral part of WordPress’s success. That and the fact that it’s free and open source (obviously). It is simultaneously the world’s most popular blogging platform and CMS; beating out all competitors by impressive margins. As such it has helped to revolutionize the way we (both businesses and individuals) communicate. It’s how we break news, build community around specific topics, review products, conduct debates and a whole slew of other forms of communication. But what it hasn’t done yet is fundamentally change the way in which we tell stories. I mean that, for the most part, what we’re used to seeing on a blog or WordPress website is just a digital version of an existing print format. The biggest and most popular changes we’ve made are the addition of hyperlinks, embedded videos and animated gifs. A far cry from fully embracing a digital landscape and effectively re-inventing the art of storytelling. Something that is not only possible right now, but is just waiting to happen! Yet no one has done it. Of course, many of you are probably wondering what it is. So let’s just jump into some concepts that could (probably) happen on WordPress and afterwards talk about the viability and potential market for such experiences. This is an idea I’ve been sitting on for so long that I felt it finally time to publish something about it in the hopes that someone, somewhere will want to make it. I initially bounced this around with some of my friends as far back as 2007 and WordPress at the time was not as flexible and powerful as it is today. So in a nutshell, here’s the WordPress storytelling concept I call The Gmail Experiment. Much of our lives comes at us through email. We have an emotional connection to it that is both unique and intense. For many of us it’s the first thing we check when we wake up and the last thing we do before going to bed. It’s personal, practical, and essential. So why not tell stories in that environment? 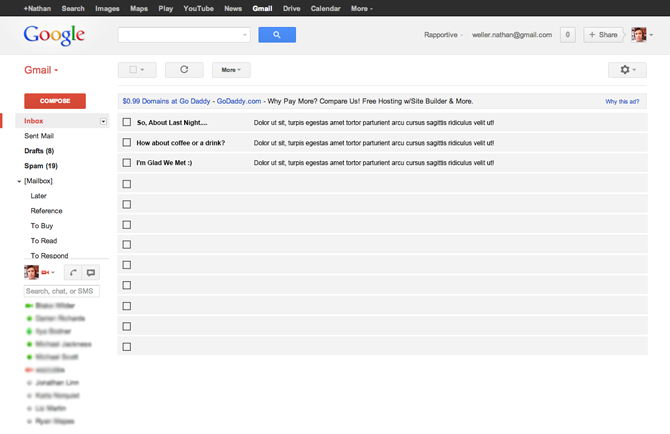 I think a Gmail style WordPress theme where emails, chats, etc. are custom post types could provide a rich app-like environment for interactive stories to unfold. Imagine a WordPress install running such a theme, equipped with the necessary plugins to make the interactions I’ll describe possible (probably BuddyPress + a gamification plugin). A reader arrives on the home page of said site. There are a few “story paths” that greet them. Do you want to experience a couple falling in love through a series of emails/chats/and google hangouts? How about a battle of wits with a fictitious criminal trying to recruit you for a dangerous job? Or maybe you’re part of the ground crew of a mission to Mars and it’s your job to analyse the images and videos being transmitted back to earth? Working with a team of other users/”readers” to come to various conclusions and solve problems. You could even be on the receiving end of famous stories centering around various types of correspondence: Frankenstein, Dracula or The Mountains of Madness. All of these scenarios can be uniquely experienced through an email environment in a way that engages and connects to the audience in brand new ways. For the sake of this concept lets explore a few options you might have if you chose to follow the “couple falling in love” path. Would you like to take part by giving one or both parties dating advice? It might even be fun to work with other users/”readers” to help make special moments happen for the couple in question. Or what if you could earn points/badges based on how well you read and interpret how the relationship is going? The possibilities are endless as there could be a fun combination of pre-made content as well as content produced in response to those participating in the stories. I think you get the idea. Next concept! Remember this? Or how about a slew of these a while back? Beautiful, interactive, story-based web experiences that delight and take the breath away. My question is: why hasn’t any of that web design creativity made its way into the way we build WordPress sites? I mean, I get it. The vast majority of WordPress users are interested in setting up a standard website for their blog or business. Telling stories in unconventional formats doesn’t really meet either of those overwhelming needs. So the easiest money for everyone is in supplying themes and plugins that empower the core WordPress user base. But what if there is another huge user base out there just waiting for the right tools to create mind-bogglingly immersive stories with a web-first mentality? I think it’s worth considering. Which, obviously, I have. So how would my concept of a “scrolling graphic novel” work? 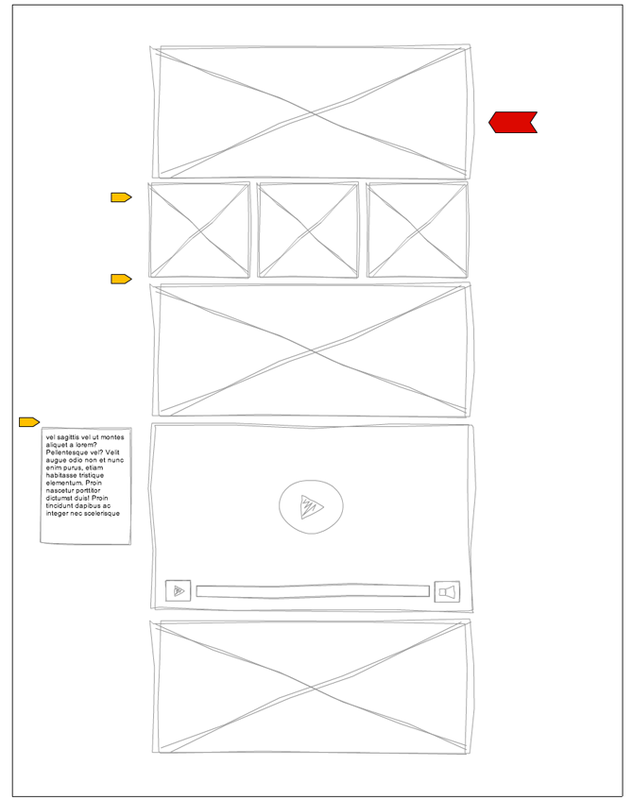 Building off of the principles graphic novel artists and writers already use to create and place their page frames we can remove the pages and create a more streamlined distraction free story flow. Text, image “frames”, “full page” graphics, motion graphics, video, etc. All of it would smoothly flow and “unfold” downwards (or possibly sideways). I imagine two web-specific features that would really make this an enjoyable experience beyond the intuitive and seamless flow I just described. The first is a sticky bookmark button that tracks with the reader’s scrolling. This of course will allow any reader to place a bookmark where they left off and return to their spot when ready. The other feature I have in mind is a new annotation/commenting functionality that allows readers to place their thoughts/comments/annotations throughout the piece. Comments would be indicated by small markers on the opposite side of the screen from the sticky bookmark and with a single click any reader could open them up and join the conversation or add their own thoughts. Hopefully the image above helps to illustrate what I mean by all of that. Next concept! 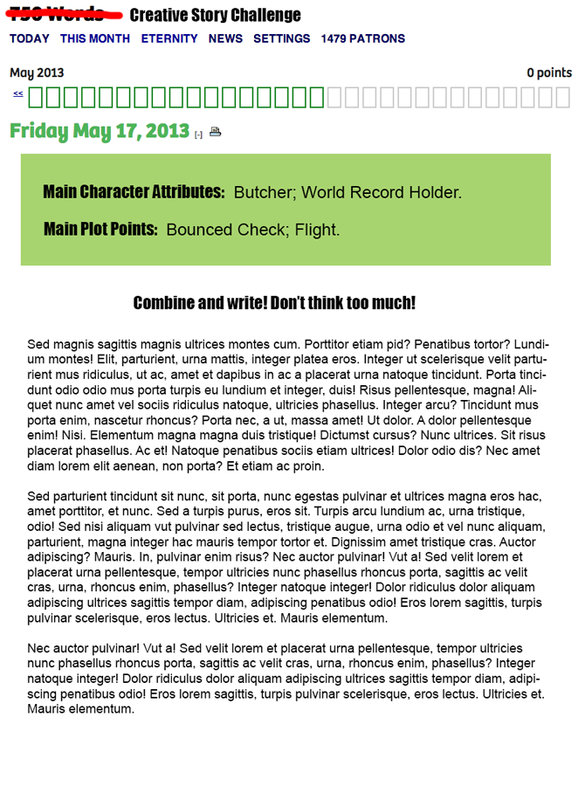 Imagine a combination of 750words.com and The Storymatic running on a WordPress Multi-site with BuddyPress. When community members log in they are greeted with a blank frontend word processing screen and a writing prompt. 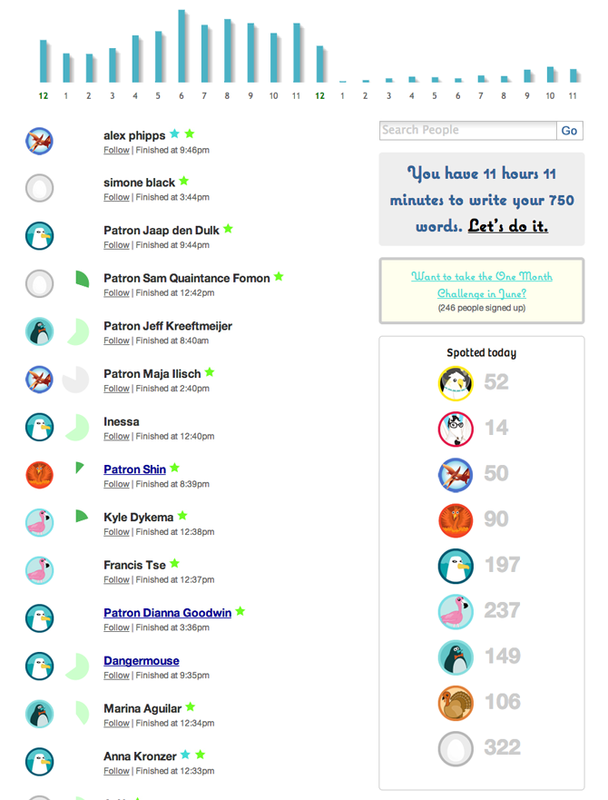 It’s timed with specific word count goals to encourage lots of free writing and spontaneous storytelling. At any point in time a writer feels stuck they can opt to have another writing prompt revealed to help keep their creative flow alive and propel their story to completion. When finished, the writer is taken to an analytics screen that shares some stats and tips for improving the next round. Continued participation unlocks accomplishment badges and even improves their stories’ visibility on community pages (if they choose to make their stories public). You may be wondering: where in the world did all of that come from? Well, I guess it’s a combination of experiencing the incredible ingenuity and creativity of some fellow artists on the web and my recent re-immersion into the art and design culture. It’s got me dreaming again. I’ve been closely following the Canadian astronaut Chris Hadfield as he’s been sending the most amazing videos from the International Space Station; As well as another huge inspiration of mine Jack Conte who creates the most astounding music videos on a regular basis via his YouTube channel (which lead him to launch the new service Patreon that helps digital artists make a living via monthly “tips” from their fans); And then there’s the blog posts I’ve been reading over at The Digital Telepathy Betterment Blog where their main focus is making the web a better place through design innovation. I love how each of these people/groups is helping to move the web forward and the more I thought about it I decided it was better to share my somewhat odd or bizarre ideas about the intersection of the web, WordPress and storytelling than to continue to sit on them and potentially let them go to waste. I decided that even if I don’t personally get to make any of these ideas happen, I might help spark a conversation that results in something really special. Personally, I could see a whole group of design and development shops pop up in the coming years to provide various themes and plugins for WordPress users interested in creating beautiful stories like the ones I’ve just described above. And I’d love to be a part of it! Maybe this is the start? So please, let me know what you think about this unique intersection of the web, WordPress and the art of storytelling in the comments below. I’d also love to know if you think there are other exciting spaces for innovation within the WordPress ecosphere. This is ABSOLUTELY the start, and I’m building a series of themes built specifically for interactive storytelling. This sounds so amazing. I’ve been digging into this more and more. Virtual avenues are all taking the approach of story based applications. Something like this makes me giddy inside. A personal story carries a big impact especially when it’s visual with video, photos, copy, and audio. I know a lot of creative artists that would totally dig this. Just a few thoughts to share now…. – Your ideas in this article are cool, but what would visualising much of what you’ve stated in 3D bring to the table? Content doesn’t ‘pop’ open, it doesn’t overlay in WordPress,it doesn’t auto-link to other related items and grow into ‘packets’ of related or themed content. I’d be interested in your views? – Finally, for now, when you do curate thousands of articles, we only have categories, sub-categories, and 2D custom post types to use as linkages – if we are to expand inline with human thinking, it would be awesome to have relationships like molecules of linked content with controlling knowledge ‘atoms’ that store the relationships or context knowledge. Just some food for thought – be interested in your views/expansions over the above. -On Gamification: You’re completely right about WordPress Gamification needing some serious design and development help. It could be MUCH better. Maybe the topic of a future post??? -On 3D: I tried my best to keep the above concepts within the current constraints of existing commercial tech. 3D is not something that’s possible at the moment. On a personal note: I haven’t enjoyed 3D on TV’s or at the Movies…but I’m always open to new things. Who knows? Maybe when 3D makes its way to personal computers it’ll be much better? -I’m really not sure how to visualize your last point. What a dream to stumble across this article! I’m a middle school story-telling teacher working to build an interactive website for students to share autobiographical poems and stories. 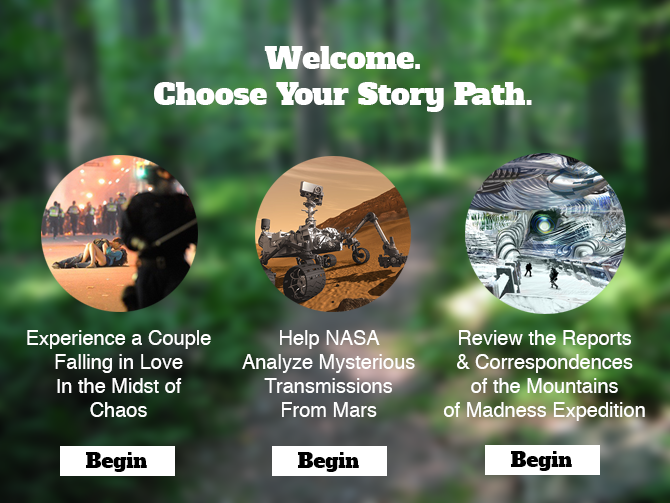 I LOVE the idea of a landing page that pulls viewers in through 3 story path choices, but in the example of my students work, it’d be true stories: “Dance with all the cowboys on a Navajo Reservation,” or “Leap over your neighbor’s fence to escape the cops,” or “Get lost in a daydream on the beach in Los Angeles” (all of which are from real student poems! Ex.the cowboy poem is here: http://poetwarriorsproject.tumblr.com/tagged/crownpoint-nm#/post/42419483655). After the reader chooses to click one story path, the second page would obviously include that poem, and option to comment on it, but also feature menus for how to access all poems about that topic, or hop to an all poems portfolio page (basic grid) and dig into the full archives. As I said, I’m a teacher, so I don’t have much experience with web development. Any advice with what platforms to use to make this happen would be amazing! I’m so glad that you are excited about the storytelling potential of WordPress. Since I made the decision to write this piece I’ve been doing a ton of research into story structure, hoping to marry my knowledge of WordPress with a deeper understanding of how stories are made and presented in different formats. I realize this is a shameless plug but if you subscribe to my newsletter at http://nathanbweller.com/ I will be rolling out a ton of WordPress Storytelling resources in the first few months of 2014. I especially love that third idea. I’ve had a couple similar, but more minimal, projects in mind over the years, but I have a few key gaps in my programming knowledge right now to hack together the plugins necessary to make it happen. I’d be interested in hearing if anyone puts one or more of these ideas into effect somewhere. Thanks Jim! Obviously I’d love to see them all made, but I think the community aspect of the third idea would give it more momentum than the others. It would also (probably) be the hardest one to get right. But I’m sure it’s possible! I came across this video today and it got me excited about learning new things. Maybe learning PHP won’t take as long as you’re thinking? Nathan, I wonder what the best venue for an ongoing discussion would be. Blog comments aren’t really top-of-mind for most, but I’d love if the conversation would continue. I pitched the idea of an interactive, collaborative storytelling platform about a year ago. Unfortunately, no one seemed interested. Not WP devs on Twitter. Not other writers in my community. I couldn’t even gain traction on Kickstarter or IndieGogo. As great as these ideas are, they all take time to be fully realized. Unless someone with deep pockets comes along to either finance the project or forgo pay in order to engineer it, I have a fear that any similar endeavor will remain just an idea on the chalkboard. I think it’s one of those things where someone just has to take the first steps. They’ll have to build it, use it to tell compelling stories and create their own community around it. While I would love to see something like what I’ve written about above to get funding, I think a hobbyist will probably break the first ground here. As a lover (enthralled-er) of this idea, I think the biggest challenge would be pairing writers, illustrators and programmers. I’d love to do something like this. LOVE TO. But my skill set is in writing and print design, and falls well short of the code base necessary for this. So: if anyone wants to tap me on the shoulder, and make a gorgeous scrolling-graphic novel version of this section of my book, please do. So in short, I agree with you. It’s going to take a shift in perspective and conversation to get designers, developers, writers and other artists all in the “same room” so to speak. The funny thing about that talk summary though, is that the web is actually the first place where all of that is possible. One point I made in my talk though, is that from a business model perspective, selling an app environment is more viable than selling a premium website. BUT because the web is so free and open, it’s probably the best place to experiment for cheap, migrating the lessons learned in this massive sandbox to mobile app experiences that are easier to monetize. BTW. The first story “falling in love in the midst of chaos” has been debunked. The couple has been overrun by the police so that the girl fell and her boyfriend comforted her.